Ohio boaters are required to carry at least one U.S. Coast Guard approved Type IV PFD (ring buoy OR seat cushion) on all vessels that are 16 feet in length or greater, plus a wearable PFD for each person on board. No person shall ride or attempt to ride upon water skis, surfboards, inflatable devices or similar devices being towed by a vessel without wearing a U.S. Coast Guard approved Type I, II, or III PFD or a Type V PFD specifically designed for water-skiing, in good and serviceable condition, and of appropriate size. No operator of a vessel shall tow any person who fails to comply with this law. All PWC operators and occupants must be wearing a Type I, II, III or V personal flotation device. All vessels less than 16 feet in length as well as canoes or kayaks of any length are required to have one Type I, II or III wearable PFD per person. Inflatable PFDs are not intended for children under the age of 16 years. All boaters or passengers younger than 10 years of age onboard a vessel less than 18 feet in length must be wearing a U.S. Coast Guard approved PFD. 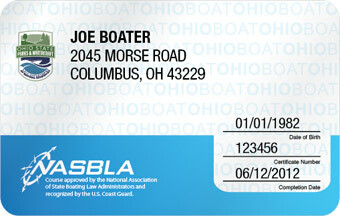 By operating a vessel on Ohio waters, you have consented to an alcohol test if asked by a law enforcement officer. Refusal to undergo testing is an offense in itself and may lead to a loss of operating privileges for up to one year as well as fines. "Zero Tolerance" prohibits persons younger than 21 years of age from consuming alcohol and operating a vessel with any measurable alcohol level at or above 0.02%. The Department of Natural Resources regulates the state boating laws in Ohio. Numbering and registering a watercraft are two separate functions. Boaters cannot operate any watercraft without a valid registration. Evidence of registration is shown by displaying two square tags or one rectangular tag (Alternative Registration for watercraft propelled by human muscular effort), and carrying the valid registration certificate on board the watercraft. All watercraft principally operated on Ohio waters must be registered and issued an Ohio Registration Certificate by the Ohio Division of Parks & Watercraft. "Bellyboats"/"float tubes", kiteboards, paddleboards and sailboards. A bill of sale from a watercraft dealer containing the required information. *Registration Certificates and tags are valid for up to 3 years and expire on March 1st of the year indicated. All watercraft less than 14 feet in length, which are permanently fitted with a motor of 10 horsepower or more. Note: Outboard motors that are 10 horsepower or more are also required to be titled. Some watercraft listed above and on the previous page may not have needed a title when it was originally purchased. Prior to selling the watercraft, however, the owner must apply to a title office and obtain a title. Watercraft less than 14 feet in length with a permanently affixed mechanical means of propulsion of 10 horsepower or greater and purchased on or before January 1, 2000. When a watercraft is registered, the boat owner will be issued a Certificate of Registration, assigned boat numbers and a decal. The assigned number is in three parts, beginning with the letters "OH", and followed by four numbers and two letters. maintained to be clearly visible and legible. For example: OH 1234 BX or OH-1234-BX. No other numerals or letters may be displayed on the bow. Two square registration tags are issued with each traditional boat registration. On numbered boats the owner shall securely affix the tags on each side of the bow six inches toward the stern from the number. The tags must be clearly visible in normal conditions and affixed prior to operation of the watercraft. Documented boats must display one tag on the port side and one on the starboard side. 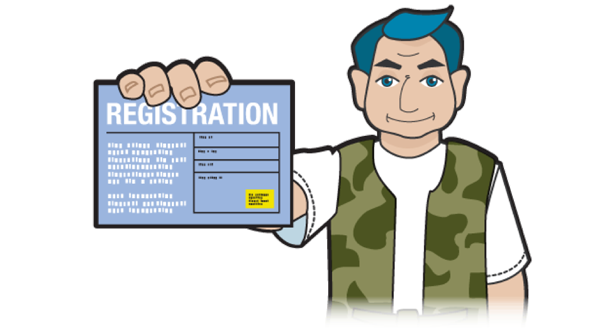 When registering a vessel, a registration fee will be required. Please refer to the chart for the different options of fees. Note: If you attach a motor (permanently or not) to a vessel registered as "hand-powered," you must change the Type of Propulsion on your registration. See Add-a-Motor Proration Fees below. The proration is only valid for traditional registrations that are adding a motor, and the change must be made at a watercraft registration agent's office. A title is required for all powered boats 14' and greater in length, outboard motors of 10 or more horsepower, and Personal Watercraft. Titles are handled by county Clerks of Court. Contact the Clerk of Court in your area for more information on obtaining title information. Add-A-Motor Proration Fees. Fee is prorated based on time remaining on current registration. The fees paid to register a watercraft are deposited in the Waterways Safety Fund, which is used to operate Ohio's boating program. All registration fees include a $3.00 writing fee which goes to the agent where you buy your registration. Ohio's watercraft registrations are renewed triennially, which means decals are valid for three years. Registration certificates and tags expire on March 1 of the year indicated and are to be removed when they become invalid (expired). Non-native aquatic species, plants, fish and animals are invading coastal and inland waters. These pests can increase dramatically under the right conditions, displacing native species, clogging waterways, and impacting navigation and recreation. Once introduced, they are nearly impossible to eliminate. Hydrilla, Egeria Densa, Water Hyacinth and Zebra Mussels are nuisance species that can be accidentally transported by recreational boaters when caught in propellers, intakes or attached to hulls. Controlling Water Hyacinth and Egeria Densa is a multi-million dollar problem. Inspect your boat and remove aquatic plants or animals before you leave any body of water. Wash your boat before putting it into a new body of water. To stop the spread of aquatic nuisance species, it is best to clean your boat before you leave the body of water. A person operating a personal watercraft that is equipped by the manufacturer with a lanyard-type engine cut-off switch, must attach the lanyard to the person, the person's clothing, or personal flotation device as appropriate for the specific watercraft. No person shall operate or permit the operation of a personal watercraft unless each person on the watercraft is wearing a Type I, II, III or V PFD at all times. Remember: Inflatable PFDs are NOT intended for use with PWC. PWC must operate at "no-wake" speed when in designated "no-wake" zones or shore zones. No person who owns or has charge over a personal watercraft shall permit operation in violation of laws. Lake Erie is one of Ohio's most popular recreational boating locations. There are certain considerations when boating on Lake Erie that boaters must be aware of. Remember to keep at least 100 yards from U.S. Naval vessels, which are occasionally found on the Great Lakes. You are also required to reduce to "no wake" speed when operating within 500 yards of such vessels. If for any reason you need to approach within 100 yards of a Naval vessel, you are required to contact either the vessel or the US coast guard before doing so, on channel 16 of your VHF-FM radio. Failure to do so is a felony offence. Lake Erie borders Canada. As such, boaters who cross into Canadian waters must report for customs inspection. ALL boaters and passengers will require a valid photo ID as well as a passport or a birth certificate. For further information, call Canadian Customs at 1-888-226-7277. All boats entering the United States from Canadian waters that have passengers who were on Canadian soil must report to U.S. Customs. This legal obligation may be met by telephone. You can call on route with a cellular phone or immediately upon arrival to the United States. The name of the marina where you first arrived on the United States side.U.S. Customs and Border Protection has offices in Ashtabula (440-964-2510), Cleveland (440-891-3800), and Toledo/Sandusky (419-259-6424).